Living in Quito is the only way to get into Heaven without dying. 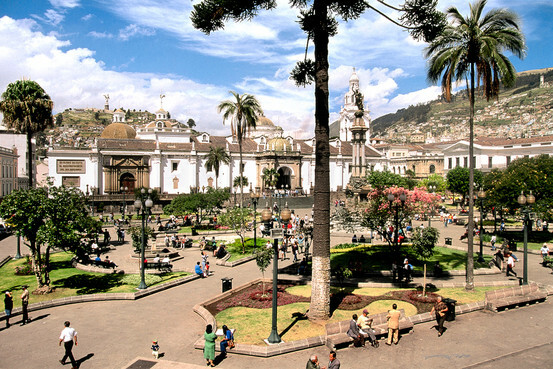 Quito’s Plaza de la Independencia, with the city’s winged Virgin of Quito statue on a hilltop in the distance. Hanging lanterns illuminate La Ronda Street, a cobblestone walkway dating back to the colonial era, where couples and children stroll past coffee shops and courtyard restaurants, and pots of red and pink flowers rest on wrought-iron balconies overhead. A woman stands in an arched doorway, stirring a spoon in a big wooden jar of hot orange juice for canelazo, a local warm beverage made with cinnamon and sugar-cane alcohol. Ecuador's capital city, Quito, is trying to revamp its image from stopover into a destination in its own right, replete with new boutique hotels to entice travelers. Candace Jackson reports from Quito, Peru. Perched at 9,000 feet on a narrow Andean plateau, Quito was one of the first cities to be designated a World Heritage site back in 1978. Unesco calls its Old Town section, filled with ornate Spanish-colonial churches and monasteries from the 16th and 17th centuries, the “best-preserved and least-altered historic center in Latin America.” But until recently, crumbling buildings, diesel-fuel pollution and a high local poverty rate outshone the city’s charms. Most visitors in Quito were simply stopping over on their way to the Galapagos Islands or elsewhere in Ecuador, and many tour books and guides deemed the historic section too dangerous for tourists after dark. What to do: Local police, including some who speak English, give free tours of the Old Town, starting at the Visitor’s Center on Plaza de la Independencia (www.quito.com.ec). Take the Teleferiqo cable car up Guagua Pichincha; at the top are hiking trails, cafés and an oxygen bar, for those bothered by the 13,000-foot altitude. “It was like adventure tourism to go to the Old Town,” says Patricio Gaybor, marketing manager for Ecuador’s tourism ministry. Street gangs controlled the chaotic markets, and pickpockets were common. Even locals venturing there would leave purses and jewelry at home. Hoping to overcome its rough image and draw more international tourism, Quito has spent hundreds of millions of dollars cleaning up the historic center, restoring plazas and centuries-old landmarks and beefing up lighting and security. The rehabilitation accelerated in 2003, when Fonsal, Quito’s municipal cultural-preservation agency, began working with illegal street vendors—Quito calls them its “informal sector”—to move them peacefully into smaller markets created outside the district. The efforts have helped revive tourism in Ecuador, where the industry’s revenue grew to $766 million in 2008 from about $400 million in 2000. Much of the gain, tourism officials say, has come from Americans, who seem to find Ecuador exotic yet accessible. Ecuador uses the U.S. dollar, it operates on Eastern Standard Time (though not daylight time) and there are direct flights from a few U.S. cities, including Miami, Atlanta and Houston. Ecuador’s best-known attraction, the Galapagos Islands, with their blue-footed boobies and Darwin history, have limited growth prospects; because of overcrowding, they made Unesco’s 2007 list of endangered World Heritage sites. Quito is emerging as an urban alternative. A new international airport is set to open next year about 12 miles to the east. Boutique hotels are opening, and cutting-edge restaurants are serving upscale versions of locro, a thick potato soup, and ceviche, a cold fish dish often served with popcorn in Ecuador. 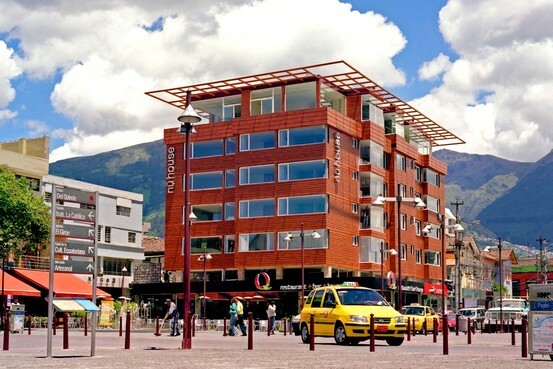 The city is a popular starting point for trips toMitad del Mundo, or “Middle of the World,” the equatorial marker just outside the city, and to Cotopaxi National Park, home to an active volcano. Some travelers take excursions to accessible parts of the Amazon jungle and to Ecuador’s famed cloud forests, where an almost constant mist creates dense, lush greenery and diverse animal species including hundreds of types of birds. Hot springs, like Papallacta, are a short drive away, as is Otavalo, the huge outdoor market where local entrepreneurs sell everything from alpaca sweaters and beaded jewelry to livestock. The drive from Quito takes you through small towns where the local delicacy cuy (aka guinea pig) can be found roasting at the side of the road. The altar at the Iglesia de San Francisco. La Iglesia de San Francisco, a massive 16th-century cathedral in Quito, Ecuador is undergoing a multi-million dollar restoration. But among the Incan and Catholic iconography, forensic archeologists made a few grizzly discoveries. Candace Jackson reports. 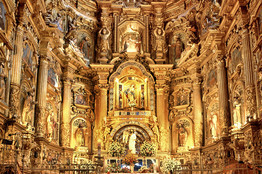 Most visitors tour at least one of Quito’s baroque churches. 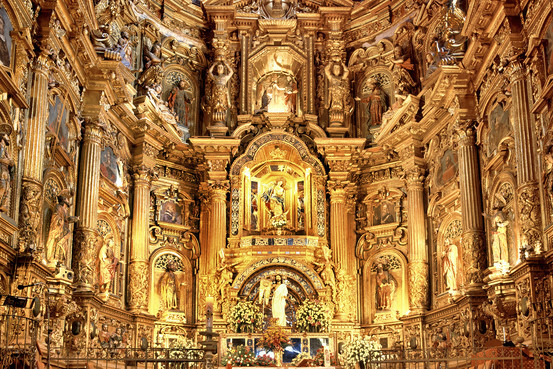 Among the oldest and largest is Iglesia de San Francisco, which Spanish conquerors built on the site of an Incan palace over the course of a century, starting in 1535 and adding the main cloister in 1605. (Parts of it are closed during a $2 million renovation, but the church’s museum and choir are open.) At the dome-ceilinged Iglesia de la Compañía de Jesús, from 1605, ornate gold leaf covers almost all the interior, filled with detailed carvings and statues of angels and religious figures. Early evenings are the liveliest, and loveliest, time to explore. Along the Old Town’s cobblestone streets, women prepare empanadas and fried corn in doorways. In the Plaza de la Independencia, candy sellers in felt hats with peacock feathers and boys with shoe-shine kits wander among pink-flowering trees. Overlooking the Old Town is the winged Virgin of Quito, the city’s signature statue, built on a hill that was considered sacred in pre-Incan times. Quito can be difficult to navigate on foot. Cars and motorcycles often make blind fast turns, zooming inches away from narrow sidewalks crowded with pedestrians. Taxis are plentiful and cheap, though they sometimes double their rates for tourists. Quito is working to become more pedestrian-friendly; within the next few years, it plans to close several streets in the historic center to buses and cars. Amid all the old-world charm, there are signs of the “informal sector.” Vendors wander the Old Town hawking everything from toilet paper to trembling puppies, scurrying away only halfheartedly when police approach. In Itchimbía Park, with a glass cultural center offering some of Quito’s best views, a small shack is home to several squatters; a line of colorful laundry swings in the breeze. In Quito’s modern New Town, many of the concrete-and-glass structures—many built during the oil boom of the 1970s—are today blemished with graffiti and soot. Sections here also are targeted for renovation. In La Mariscal, Quito’s main nightlife area, the Plaza Foch has outdoor cafés with heat lamps for al fresco dining during chilly mountain evenings. Old Town residents say it would have been hard to imagine all the tourists even a few years ago, when La Ronda Street (also known as Calle Morales) was rife with prostitutes and thieves. Vieres Caterine, who has lived and worked there for 48 years, says he used to close his small snack shop before sunset , and sometimes got into fights with thieves who entered the shop in broad daylight. Today, he stays open until 2 a.m. on weekends. It’s a crisp Andean morning, and South America’s prettiest colonial capital is coming to life with people, pigeons and sunshine. “Papas! Aguita! Papitas!” A street vendor in a bowler and with a child strapped to her back carries a stack of golden crisps. City clerks in sharp suits scan today’s paper, while shoe-shiners get to work on their shoes. Schoolgirls in tartan skirts swap gossip and chewing gum. And watching over us all from her Panecillo hilltop is Quito’s famous Virgin. 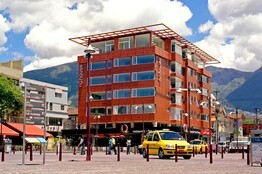 While the city awakens, I sip coca-leaf tea at the window of the new Hotel Plaza Grande. Actually, it’s quite venerable, but like much of the old town has recently been restored to its former belle epoque splendor. The porters wear top hats and white gloves, and there are inkwells and gold-tipped quills in the rooms. Here at the leafy Plaza Grande, the belle and the less belle epochs of the city converge. It is an historic hot spot that boasts the presidential palace and a baroque cathedral. And it was here that the first expeditions into the Amazon started, and where the lives of at least one president and one bishop ended rather messily. With an irony that is pitch-perfect, the bishop’s palace now houses a restaurant called Mea Culpa. Vendors like the crisps seller are rare these days. Most of them have been given stalls in the new markets as part of a regeneration project. Well-groomed parks dot the seven sacred Inca hills, and Quito is now the continent’s greenest capital. Brightly colored facades jazz up the streets and derelict buildings have been turned into attractive homes for the wealthy. Once a seedy backwater, the old town is becoming a trendy place to live and visit. True, it was exciting before, but now you are much less likely to be relieved of your wallet. Two years ago, it wasn’t safe to stay in the old town; today it would be madness not to. The nightlife used to consist of pickpockets and prostitutes, but now the cobbled Barrio la Ronda is the trendiest place to hang out. You can watch the street from the new upstairs restaurant Los Geranios, while savoring yaguarlocro, a black pudding soup with a bloody history. If you’re lucky, you might hear the pasillo, Ecuador’s equivalent of Portuguese fado, sung in one of La Ronda’s bars. What delights me is that there are no scheduled tourist-pleasing events. Just turn up and stick around. By day, La Ronda’s main street is lined with workshops, galleries and craft shops. An orphan mission run by Italian nuns has opened as a cafe. In the courtyard of Misioneras de la Ninez you can enjoy freshly-baked pastries and Ecuadorian hot chocolate. Two years ago, you couldn’t buy a bar of Ecuadorian chocolate because it was all exported. Now there are single-origin varieties for discerning chocoholics. Shopping has also arrived in the old town. My head is encased in a Panama hat from Ecuador’s oldest hat-maker, Homero Ortega, who has a new shop in Plaza San Francisco. The gallery-shop Sinchisancha at San Francisco has top-notch Amazonian crafts, and the Corporacion Metropolitana has opened a shop in Plaza Grande, where you can buy Ecuadorian cigars and coffee. Quito is still a relatively shy star, but new boutique hotels in old colonial mansions are already competing for the increasing flow of visitors. I spent a few days at the Patio Andaluz, a Moorish mansion whose courtyard restaurant serves Ecuadorian lunches. The staff wear red Andean capes, an extravagance that somehow stops short of being kitsch. 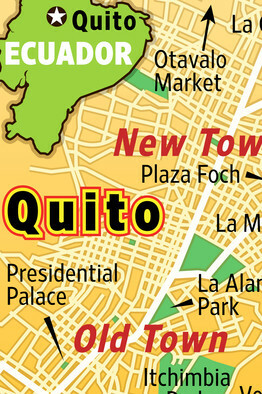 This is the thing about the new, old Quito: it is made of such durable stuff. And to make sure that it never falls prey to falsehood, a new generation of artists is being created at the Escuela Taller de Quito I, an artisanal school for underprivileged teenagers. Together, apprentices and masters have restored a colonial maternity hospital into the most charming school I’ve ever seen. You can visit between 8am and 4pm and meet tomorrow’s stone carvers, carpenters and restorers, all trained in yesterday’s crafts. Already they are making altar pieces and carved columns so eye-wateringly beautiful that they could easily slip into Quito’s emblematic monastery San Francisco and pass as the real thing. These kids are the latest graduates of the Quiteno style, the colonial offspring of the gunshot wedding between Spanish Catholicism and indigenous aesthetics. Everywhere you look, you see cupolas, spires, baroque follies, life-like Virgins and Inca suns. The San Diego cemetery, perched above the town, is a thing of beauty, with its mausoleums and melancholy angels. Inside the spooky 16th-century San Diego convent next door, where nuns scurry in the shadows, I spot the most extreme Christ in a country where gory crucifixions adorn every church and even the odd restaurant. “This is how you love,” says a note that someone has pinned to his feet. The mystic 17th-century Quiteno artist Miguel de Santiago allegedly killed one of his students to make his shocking sculpture of the dead Christ, and today you can still wonder at it in the San Augustin Monastery, where monks live in seclusion. But the greatest marvel at the heart of the old town is San Fransisco, the continent’s most extravagant religious center. It has miraculously survived countless earthquakes and volcanic eruptions, and only now is it under restoration for the first time. I climb the scaffolding with the head architect to get baroque vertigo near the gilded, Arab-influenced ceilings and grinning cherubs. 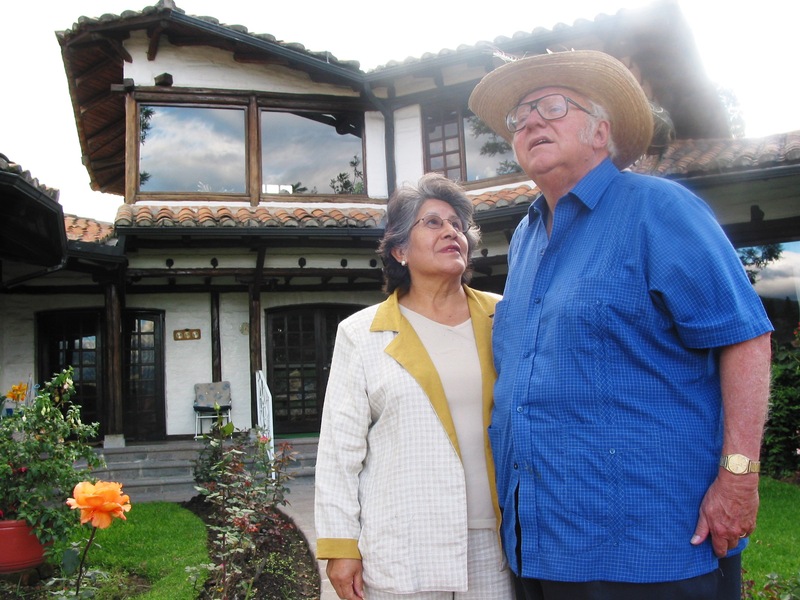 “This is the biggest restoration project Quito has seen,” Senor Cheka tells me. “This place was built on the remains of the palace of Atahualpa, and nobody has touched it since. We are digging up skeletons under the church floor. Who knows what else we’ll dig up before we open to the public.” Atahualpa was the last Inca chief, and there is a legend about the gold he left to his protege, Cantuna. Most likely, the gold is nowhere to be found, because it was used to build San Francisco, just like all the gold the Spaniards found. In return, they gave the indigenous people the promise of salvation, and mirrors that supposedly contained their souls.